New kittens are sweet, snuggly, and downright irresistible! If you already have a resident cat or dog, though, you might hesitate: Will all of the animals get along? What if your newest furry friend gets hurt by a territorial cat or a rambunctious dog? What if your older pet feels slighted by the interloper? 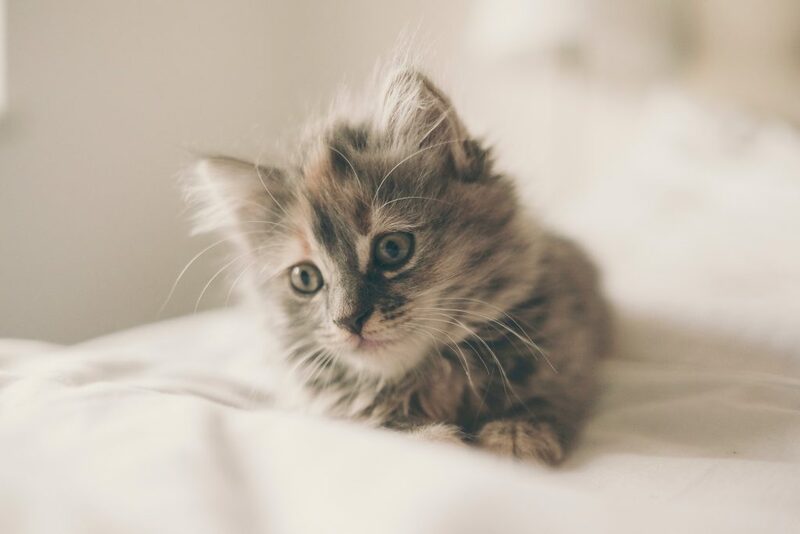 These are all common questions, and we can help ease your mind by giving you some tips on introducing your kitten to your current pets. The most important tip is to give the introduction process time. Don’t expect your other pets to accept your kitten immediately, and don’t expect your kitten to settle in quickly. It can take a young cat a week or two to feel comfortable in a new home; in some cases, it might take even longer. During this acclimation time, keep your kitten in one room that is equipped with everything a kitten needs: places to hide, food and water, a scratching post, a few toys, and a litter box. Don’t allow your other pets into this room yet. Over time, gradually allow your kitten access to other rooms of the house where your other pets have been (but don’t let them get together just yet). For example, if your kitten has been confined to your bedroom, you can put your other pets in the bedroom while the kitten checks out the living room and kitchen. Do this a few times per day for a day or two. The first step in introducing your kitten to your other pets is to let them associate each others’ scents with good things. Start by feeding your kitten right next to the door of the room she’s in, while feeding your other pets (together or one at a time) on the other side of the door. This process will intermingle the smells of the animals along with something tasty, which will promote a positive association. Next, you’ll want to increase access slowly. Start by having your current pet on one side of a glass door and your new kitten on the other side so they can see each other. From there, you will increase access more by having your current pet in a cat carrier or dog crate while the kitten sniffs around. It’s helpful to have a second person in the room to help you separate them if there is any aggression or a lot of fear on the part of the kitten. The main issue with introducing a small kitten to a dog, particularly a big dog, is that it’s easy for an over-excited and enthusiastic dog to step on or otherwise hurt a small kitten. It’s necessary to keep your dog restrained on a leash when introducing him to your new kitty. Keep him on a leash and watch where his feet are in relation to the kitten if there is a significant size difference. Dogs can be trained more easily than cats. This process will go more smoothly if your dog is already trained to understand and obey “sit,” “stay,” “lie down,” and “leave it.” Some dogs will be too excited to listen to you and will lunge, bark, or growl; if that’s the case, tell him “no” firmly and remove him from the room. After a few times, he’ll begin to understand that if he wants to interact with the kitten, he will need to behave. While you can verbally discipline and train a dog who is acting aggressively toward your kitten, that is not how you manage a resident cat who is not taking kindly to your new little one. Cats will react to stress with more aggression, in many cases, and reprimanding or attempting to train your cat is likely to result in more poor behavior. If your cat hisses at or swats at your new kitten and the kitten does not back off immediately, simply remove one of them and try again later. Some mild hissing or swatting with closed paws is to be expected. Most kittens will know that’s a signal to retreat and that the older cat is the one “in charge.” Any actual scratching or biting is uncommon and is an indication that the cats should be separated for a few more days. You can talk to your veterinarian or the shelter or adoption center where you acquired your kitten if you need more help introducing your new kitten to your resident pets. Within a few weeks or months, your kitten should be well-integrated and, with luck, will be enjoying a wonderful relationship with its new four-legged siblings.